Here's a south-of-the-border twist on creamed corn. It combines the sweet and rustic flavor of grill-roasted corn with tangy crema Mexicana, tomatoes, chiles, a few spices, and a final dusting of cotija cheese to create a great side dish. I served this alongside my Spicy Grilled Fish Tacos and some kicked-up refried beans. 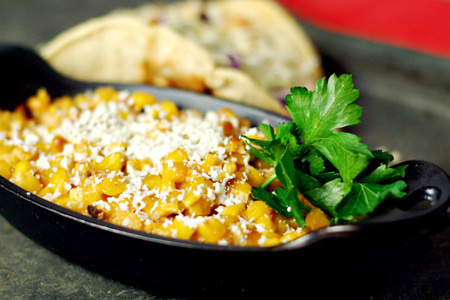 The creamed corn has a great balance of sweet and spice. Part of the inspiration for this dish came from Chris Lilly's Grilled Mexican Corn that he served us at Kingsford University. This is a sort of deconstructed version of that corn, with my own touches. Of course this recipe will be much better when fresh corn is in season, but this will give you something close year-round. It's a good way to add a burst of summer to an otherwise dreary winter or wet spring meal. Start your grill and prepare for indirect cooking at medium-high heat (400-450º). 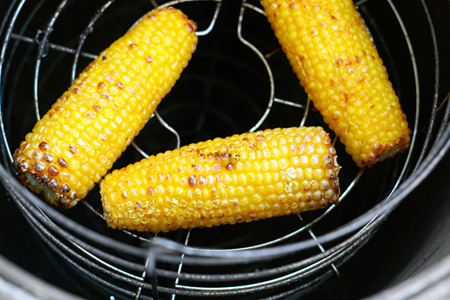 Roast the corn, turning occasionally, until some of the kernels start to brown and char. Note: If you're using frozen corn, either partially thaw it, or expect additional cooking time. Remove the ears to a platter, tent with foil, and let them rest about ten minutes. Carefully cut the kernels off of each ear and put them in a large sauce pan. Using the back of your knife, scrape the remaining bits from each cob and add it to the sauce pan. Add the water and Rotel to the pan and bring to a simmer over medium heat. Cover the pan, reduce the heat to medium-low and simmer 20 minutes, stirring occasionally. Remove from the heat, uncover and let sit ten minutes, stirring occasionally. Great twist on creamed corn - perfect side dish. This one will be making an appearance on my family's plates as soon as the good corn comes out this year. Excellent recipe, John. My wife and I are ardent food preservationist and gardeners. When the corn is at it's peak we always cook to much up, especially when entertaining, and vacuum seal the left overs in the food saver for over winter. The grilled corn seems to preserve better, maybe because its partially dehydrated and comes out a lot less mushy when thawed out. Nothing like grilled corn with a pot roast on a winters day. I'll add this recipe to my to do list, at least it's one that won't add to my waistline.